Place the paper in the tray. Swirl the marbles in paint, then take them out and place them on the paper. And let the fun begin! 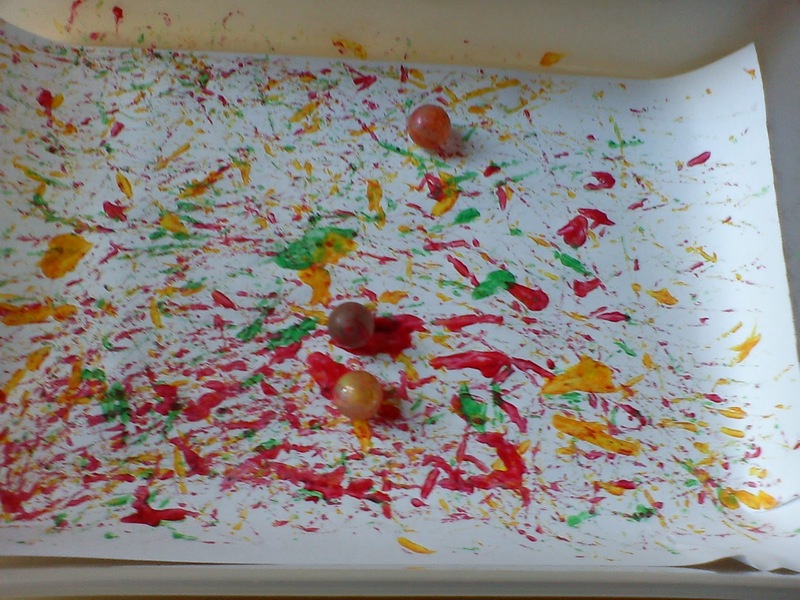 Tilt the tray to left and right, forwards-backwards and watch the marbles creating lovely strokes of paint. Happily shared with Childhood 101's We Play, Red Ted Art's Get Crafty, ABC and 123's Show and Tell, Quirky Mama's It's Playtime, Homeschool Creations Preschool Corner and Nuture Store's Play Academy link ups. I have only tried marble painting onces at playgroup..I think our paint was too thick, but we would like to try again! It is such a fun craft! Thank you for stopping by Kids Get Crafty - appreciate your visit! We have done marble painting several times. Kids love it! (And me too :D ). It is so good to use these paintings later for backgrounds or just making cards. 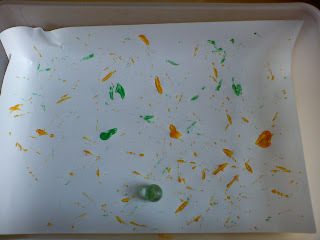 We love marble painting too - great fun and the patterns always turn out so well. Thanks for stopping by and commenting. This is really great fun :) Jenny, I love your giant marble painting,looks fantastic!